NIA CHARLESTOWN NEVIS (November 16, 2018) — Work on the Nevis Island Administration’s (NIA) water taxi pier at Oualie Bay is expected to resume shortly. Hon. 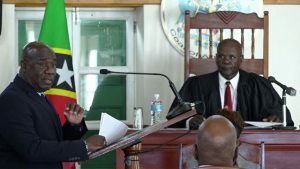 Alexis Jeffers, Deputy Premier of Nevis, who is charged with implementing the project, made the announcement while giving an update at a sitting of the Nevis Island Assembly on November 15, 2018. Mr. Jeffers stated that he has been assured by the contractor Secure Marine, based in St. Maarten, that they would resume work on the project within the next week. “Upon visiting the contractors in St. Maarten, they have given us the assurance that they will be mobilizing to Nevis between today, which is the 15th of November and the 21st of November which is next Wednesday. “We have had the assurance that this pier should be completed by December 15th and we are going to hold the contractors to that commitment,” he said. The deputy premier noted that the project began in 2017, but suffered several setbacks. In some instances, inclement weather was the reason and in one case the Environmental Impact Assessment (EIA) was done. Mr. Jeffers said he felt the need to update the public on the status of the project because of its significance to the people of Nevis. “I want to say that certainly it is a situation that we would love to have had a project completed already but certain factors would have mitigated against that,” he said. 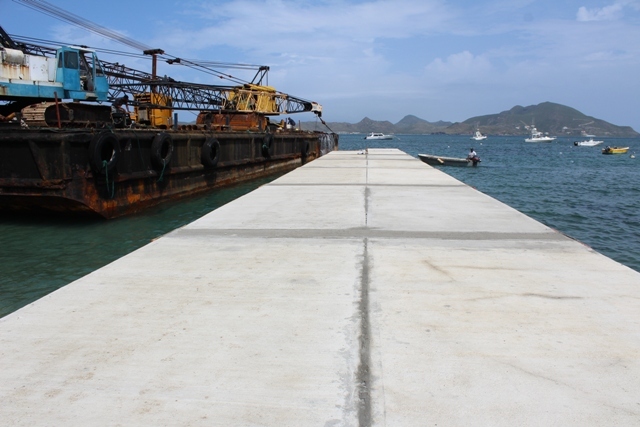 On completion, the new water taxi facility which will fall under the jurisdiction of the Nevis Air and Sea Ports Authority (NASPA), will have a reception area and parking to provide patrons with an easier point of access and exit when utilising the pier. It will facilitate the thriving water taxi service operating in the area which has been utilising a nearby privately-owned pier which is now in a state of disrepair. The $6 million project is being financed by the Sugar Industry Diversification Foundation (SIDF). Its source of funds are derived from the St. Kitts and Nevis Citizenship by Investment Programme.